This ladies' jacket is constructed using a Liz Claiborne "Crazy Horse" label denim jacket as its foundation (the size on the label is "L"). I bleached, cut and frayed the jacket, de-constructed it, and stamped it with acrylic paints. The sleeves and bottom ruffle were then newly constructed from a mix of a silky cotton vintage print and a contemporary cat print cotton fabric. Greens and browns predominate, but there are also touches of blues, grays and golds. The theme for this jacket is, "There's always room for one more cat!" The chest measures 42", sleeves are 21 " long, and the jacket length is 24". This is just the thing to wear to an art festival or cat show! And, as I like to say, it's the ONLY one like it in the whole wide world! 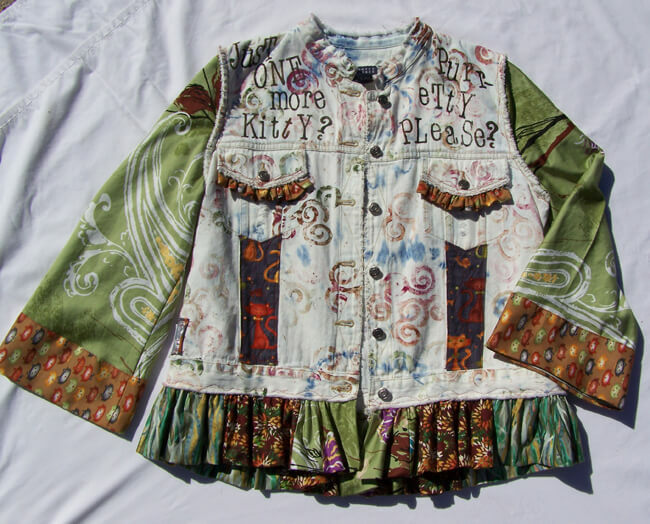 I created my line of "Red Hot Kitties Take-Out" cat-themed altered clothing during years of taking my cat art to cat shows all over the country. I wanted something interesting to wear, but all of the commercial offerings were amazingly dull and predictable. 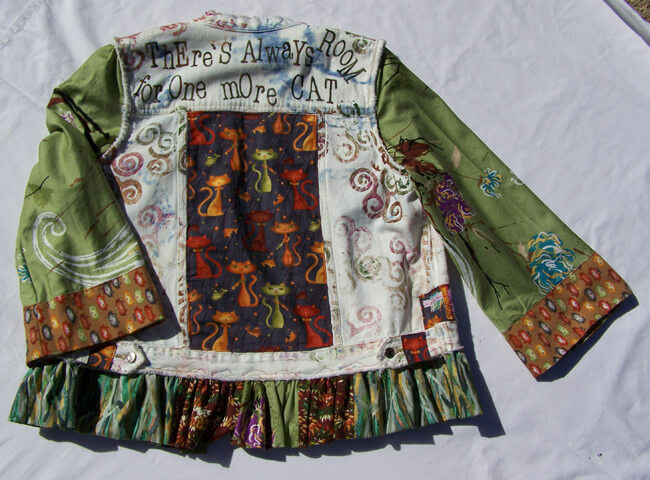 Now, I love to re-purr-pose skirts and jackets, creating wearable fabric art collage pieces with bits of vintage and contemporary fabric finds, plus silks, lots of buttons, acrylic paint, and whatever else inspires!